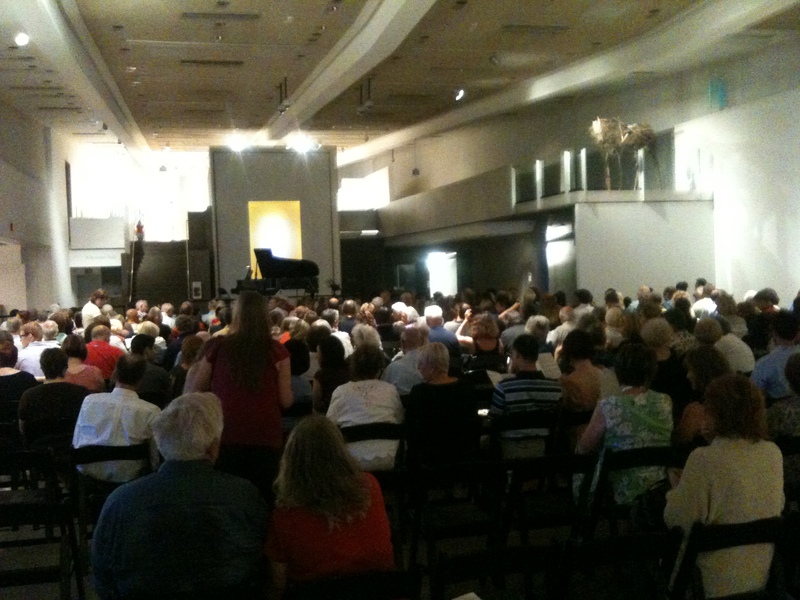 I attended the Wednesday July 27 concert of the Phoenix Downtown Chamber Series (DCS) in the Great Hall of the gorgeous Phoenix Art Museum. The DCS, a musician-run organization founded and directed by Phoenix Symphony violist Mark Dix, has been going since 2000. 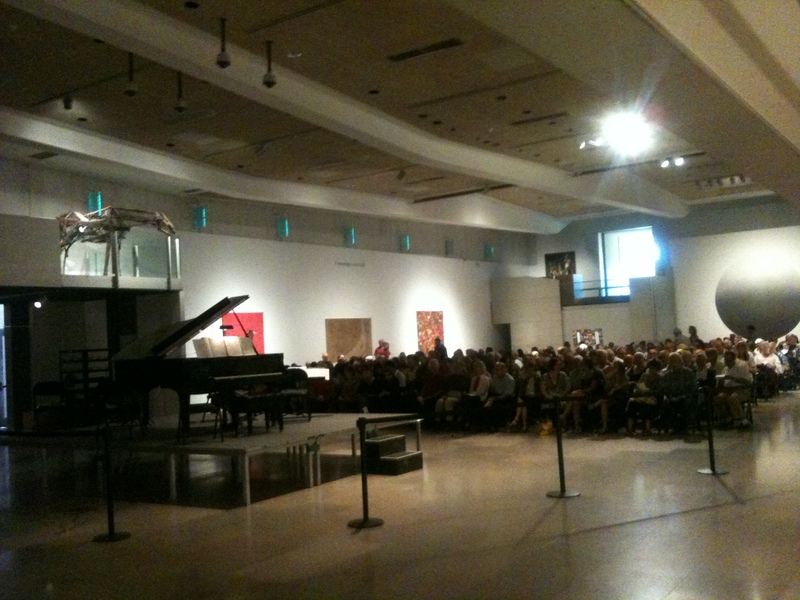 The program, except for two solo piano pieces by Granados, was of all contemporary music. Except for two more solo piano pieces, by the Cuban composer Ernesto Lecuona (1895-1963), each piece included guitar and had been commissioned and/or premiered by Duo 46, guitarist Matt Gould and violinist Beth Ilana Schneider-Gould. I listed all the performers (each of whom played terrifically well) in my preview post. The DCS presents about five programs a year (if I understood correctly), at various art galleries, museums, and warehouse spaces in the downtown Phoenix area. It’s a very interesting model: no traditional concert halls, changing venues, and the concerts are scheduled and announced one-by-one rather than a season in advance. Ticket prices are low (just $10), and there are a variety of donors (35 in the $10-99 category, 42 in the $100 and above). Volunteers (seven listed in the program for these concerts) help with logistics, ushering, ticket sales, etc. If someone had come to me before Wednesday night and asked, “How about we start a chamber music series where we just plan the concerts one by one and have them at different locations?”, I’d probably have been skeptical about the chances of building an audience. for each concert are drawn) in a large metropolitan area can certainly build a following that is not venue-specific. Having just spent five months in NY, the new-music groups Alarm Will Sound, the Metropolis Ensemble, and the International Contemporary Ensemble, each of which perform at a variety of locations, immediately come to mind as having done just that. There were about 250 people, I estimated, at Wednesday evening’s concert, which was a repeat of a Saturday afternoon performance. So the DCS certainly draws an audience. Age range? Pretty typical, it seemed to me, the vast majority looking to be, like me, 50+. Perhaps 10% 30 and under, a bit better than most classical concerts, but that’s a very rough estimate, and for one concert on a weeknight in what’s probably one of the more close-to-traditional spaces the DCS has played. This was their first set of concerts at the museum, the twelfth venue at which they’ve performed (by my count from that link). The couple sitting next to me had read about the concert in the newspaper (old media still works!). 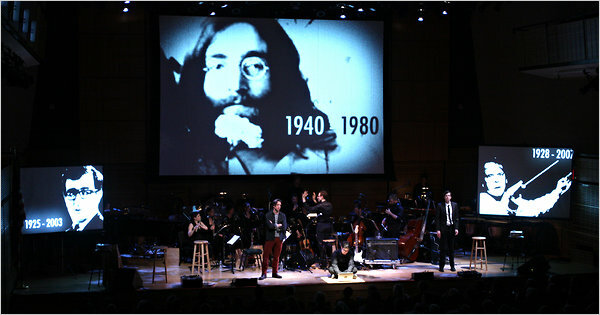 I was quite surprised when Mark Dix explained, in his remarks at the start of the second half of the concert, that the 2011-2012 season has yet to be planned, and that they have found that it works not to plan an entire season in advance, but to schedule things concert-by-concert, seeing who is available when. I’d have thought that with primarily local musicians, it would work better to get the season scheduled in advance–especially during the fall/winter/spring standard concert season. On the other hand, I do a lot of last-minute scheduling myself for the summer concert series (the Greencastle Summer Music Festival) I organize in Greencastle. We do twelve concerts a summer, and since we pay rather small honoraria and people tend not to have summer vacation and other plans set far in advance, it has worked for seven years to do the scheduling in late April and early May, with the concerts starting just after Memorial Day. I’ve been thinking about starting earlier, and perhaps for some of the performers that could work, but I’ve been assuming that for most of us it wouldn’t work to pin things down too far in advance. And at DePauw, where I teach, the music faculty wasn’t enthusiastic about scheduling faculty recitals a season in advance, until the concert calendar started getting so crowded that we were forced to do so or not be able to get a date. And many of the musicians are members of the Phoenix Symphony, and I know from my friends in the Indianapolis Symphony that the schedule can be more in flux than one would assume; run-out concerts and special events get added during the season, so you can’t always count on a free night remaining so. Obviously it’s working for them. I talked briefly with Mark after the concert; his enthusiasm for performing chamber music in visually-stimulating, energetic, spaces such as art museums is contagious. He mentioned how “dead” recital halls and churches can feel, and how little classical musicians as a whole think about the visual experience of a concert. He’s right on about that. And it’s a musician-run, local series. Which is great. With the high level of the performances, I was impressed once again by how many terrific musicians there are wherever you go in the United States, just as so many of us were impressed by the high level of playing of orchestras from Toledo, Albany, Oregon, and Dallas at the Spring for Music Festival at Carnegie Hall. Since the series presents primarily local musicians, they can pay what I assume are fairly nice fees for a gig in one’s home town. They don’t have to come up with six-figure fees to pay a big-name touring ensemble with its associated travel and hotel costs. That would require more extensive fundraising, including grants, big corporate donors/sponsors, slick program books with ads, etc. (I talked once with the artistic director of a summer series, not too far a drive away from Greencastle, about possibly booking one or two of their groups to do a concert on my series; each of the groups on his series expected a fee much larger than the budget for our entire summer.) To get a corporate sponsor for a program, you’d have to have that program scheduled well in advance. But they don’t need that. The Downtown Concert Series fulfills a very different purpose than, say, the Phoenix Chamber Music Society, which presents big-name artists like the Chamber Music Society of Lincoln Center and the Muir Quartet. This is (first-rate) local musicians putting on their own concerts, and doing a great job of it. I’m really glad I went; it gave me a lot to think about, and possibilities to imagine.